What Bugs Do Sloths Eat? 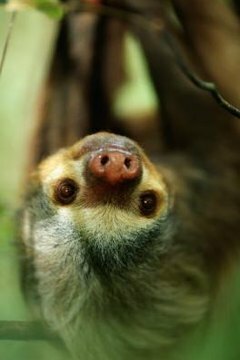 The sloth, whether he has two toes or three, is a minimalist. He does only what he must to stay alive. He does everything … very … slowly. Most bugs move fast. Therefore, a sloth can eat only bugs that move … very … slowly. Or not at all. A sloth eats what's in front of him -- mostly leaves, shoots, buds and flowers. He gets water from his food, so he doesn't need to drink. He takes a month to digest a meal and makes the long trip down from his tree to the outhouse once a week. He doesn't have much muscle mass, so he doesn't need much protein in his diet. Consequently, bugs, which offer a lot of protein, are not high on his menu. However, he can acquire some nonvegetable edibles in the process of browsing, making him technically an opportunistic omnivore rather than a strict herbivore or foliovore. A sloth may feed from 50 or more kinds of trees in the tropical rainforest of the Americas, but his favorite is the cecropia (Cecropia sp.). It grows fast and provides lots of juicy leaves and buds. It does have a drawback, though: this tree has a symbiotic relationship with Azteca ants. The ants live inside the cecropia and take some food from it, but one of the ways the ants benefit the tree is to defend it from things that want to eat its leaves. One of those things would be a sloth. In the process of munching on a cecropia leaf, the sloth might accidentally ingest an ant or two who had the misfortune to be on that particular leaf but would pay for this when thousands of disturbed and angry ants swarmed out to do battle for their home. Very slow movements seem less likely to bring out the ants, but sloths have been filmed beating a hasty -- for them -- retreat from these stinging protectors. Given that his preferred cecropia trees are so well defended, the sloth will eat from other trees. In doing so he undoubtedly ingests various forms of insects such as caterpillars and eggs. While eating fruit, he takes in small insects such as fruit flies (Drosophila melanogaster) who are attracted to and captured by the sweet stickiness. While the three-toed sloth (Bradypus variegatus) limits himself pretty much to jungle foliage and any attached bugs, the two-toed sloth (Choloepus didactylus) is not too picky to take advantage of any kind of food that crosses his path. He'll eat bird eggs and nestlings if he happens onto a nest, and even small mice and rats if he catches them. Mr. Two-Toes in captivity -- where he is much more likely to survive than his three-toed counterpart -- dines on special dry food made for leaf-eaters, along with a wide assortment of fruits and vegetables, with grapes as his particular passion. What Do Sloths Do at Night? What Eats Beetles in the Jungle? What Bushes Do Kangaroos Eat?